Very friendly, very professional , excellent food , we have been to this restaurant 4 times and it’s always really good , we will continue to return and to recommend this restaurant. It is a Restaurant with a very good kitchen. What I don't like is the oral presentation of the Desserts. The English of the Service and owner is just about ok to understand what is being offered. However, I think it is just easier for the guest to look at a written dessert Card including Prices, considering his choice rather than being told: I am the Card. Listen to me and then you can make your choice based on what I have been telling you ! We had a fantastic Mel at Bele Parti. The atmosphere is sophisticated and yet relaxed. The service was friendly and the food was superb, as was the wine list. All in all a great experience, and we would go back at the drop of a hat. I travel a lot for business and therefore I eat out a lot, as well as dining out for pleasure. Belle Parti had been recommended by a friend who does a lot of fine dining and I was not at all disappointed. I can honestly say that the whole experience was among the best that I have enjoyed, from the quality of the food through the wine to the service; I also thought the tariff was fair. Highly recommended and I will definitely be back. This is a truly outstanding restaurant. The service is impeccable, the atmosphere beautiful and well thought out, and the food fantastic. While some people have complained that it was expensive, my assessment is that the price is very fair for the quality of food, preparation, and experience. Every dish was very tastefully done. The focus is on the fresh seafood which is abundant . Spectactular setting, cuisine, attentiveness, our only regret is that we could not stay longer! Received as a personal friend and treated as such. Wonderful food and wine. A lovely hostess. Just fantastic. Staff brilliant and very warm. A very beautiful restaurant, with warm and welcoming service and amazing food and wine. 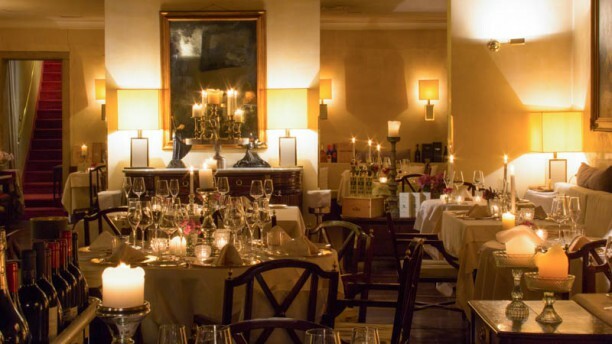 It was truly one of our most favorite and unforgettable dining experiences in Italy. Hesitate to tell too many people about - would not want it to become a tourist trap! Service and mood good, cuisine ok but rather boring, not exciting.